What do we love most about this root veggie? Well, outside of the fact that it appears as something out of a Dr. Seuss book, the watermelon radish is packed to the brim with intense color, defined flavor and outstanding nutrition. Featured in our Chicken Breast, Walnut & Snow Pea Salad, the watermelon radish is an heirloom Chinese Daikon radish in the Brassica family. Enjoyed both raw and cooked, this root vegetable has a mild peppery flavor that goes well with chevre and feta cheeses, apple, fennel, and citrus. It has a succulent, crisp flesh that lends a hint of sweetness. With its light green outer skin transitioning into a bright pink center, this radish truly resembles a mini watermelon and makes for the perfect pop of color to add to a dish. 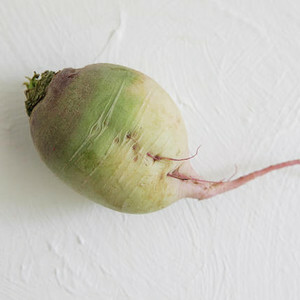 The watermelon radish is a great source of Vitamin C, and its leaves contain high amounts of calcium. Radishes have been found to stimulate digestive and liver function. They can also aid in lowering cholesterol and blood pressure. The healthful watermelon radishes in our June 2nd, 2015 dishes hail from Dublin, Georgia's Local Lands farm. This family-owned and operated establishment's mission is to "create an intimate relationship between producer and consumer and to educate all involved." Doesn't a pretty pink veggie with versatility and crunch sound like the ideal complement to most all dishes? We sure do think so.